The Frugal Family Life: Great New MAM Baby Product Coupons!! There are two new and very nice MAM coupons that will score us some great deals on baby products! Even if you don't have a little one or are expecting these would be great to pick up to have on hand for future baby showers! I love having gifts in the gift closet to choose from when needed! Head over to print this $2/1 MAM product coupon to use on ANY MAM product! 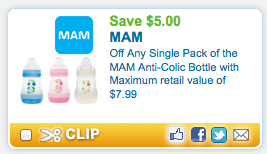 You can also use zipcode 33578 to print this higher value $5/1 Single Pack MAM Bottle coupon (valued at $7.99)! Sounds like great deals to me! !